Vacuum Circuit Breaker Widely Regarded As VCB Is Distinctive Breaker Which Used Vacuum As An Arc Extinction Medium. In Vacuum Circuit Breaker (VCB), The Fixed & Moving Contact Is Encircled In A Permanently Sealed Vacuum Interrupter. The Arc Is Defunct As The Contacts Are Separated In High Vacuum. It Is Principally Used For Medium Voltage Ranging From 11 KV To 33 KV. Krish Engineer Is An Economical Manufacturer & Supplier Of Quality Vacuum Circuit Breaker (VCB) In Ahmedabad, Gujarat. Customer Can Avail Good Quality Of This Kind Of Circuit Breaker At Our Factory. Drawout Truck Can Be Interlocked In TEST/SERVICE Position For Safety. Individual Vacuum Interrupters Are Housed In Epoxy Housing With Suitable Clearances. Compartmentalized Design With Separated Chambers For VCB Truck, CT, PT, Busbar And Metering. 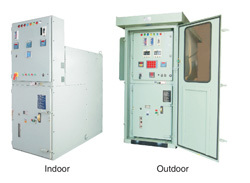 Can Be Combined With Air/SF6 Load Break Switches In RMUs And Indoor Substations.